Most of the cable you’ll see is RG6 cable, and that’s 75 Ohm impedance. The concept of impedance is fairly complex, so we won’t focus on that for now. All you need to know is that if you see an average cable with a screw-on connector, that’s 75 Ohm cable. There’s no law against using that kind of connector on a cable with different impedance, but the industry has standardized around using certain connectors with certain impedance cables. This is partially because it makes it easy to identify cables by sight that way, and partially because different connectors are good for different kinds of signals, just like different cable types are good for different kinds of signals. What does this matter in the real world? 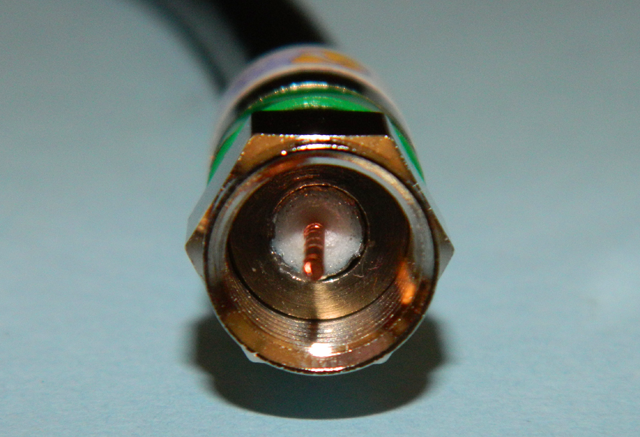 If you follow the world of cellular boosters, you’ll notice that Wilson Electronics’ boosters have always used 50 Ohm cables with N connectors, while other manufacturers have used 75 Ohm cable with F connectors (like the one you see in the picture. So which is best? 50 Ohm cable is best for the longer runs that usually happen in commercial installation. 50 Ohm cable has less loss over long runs so the signal can travel further without an amplifier. Wilson started out with commercial-grade boosters and has only recently moved into boosters for residential use. There’s nothing wrong with using 50 Ohm cable for residential boosters, but consumers are very comfortable with 75 Ohm cable and may be able to avoid running new cable if there is some in place. That’s why Wilson’s new line of residential boosters are all built around 75 Ohm cables.